The Fuller Center for Housing just received the report below from our Fuller Center partner in Sri Lanka. At the time that I am writing this report, due to heavy rains experienced in the last few weeks especially in the North and East, over 800,000 people have been displaced and houses have been totally destroyed. Many deaths have been reported due to earth slips. Transport was held up for many days in the rural areas and many thousands of people are living in camps; many have lost their houses and their personal belongings. Over 200 acres of paddy fields are also destroyed and farmers have lost their cultivation. The rain rate which was recorded at the time was nearly 300 millimeters; many lakes in Dambulla and Polonnaruwa are over flooding. Due to this reason, we had to postpone our medical camp which we were planning to have on the 10th. I immediately made a visit to some of our church believers and other families in Dambulla and some families in Polonnaruwa. It was a great shock to me to see these families, especially in the North without any income at all, to survive. They are going through a hard time without food, clothing and medicines because they have never experienced these types of floods in all their lives. 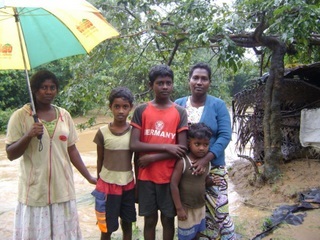 Some families who are badly affected in Dambulla and Polonnaruwa did not have anything to eat. However, we were able to distribute some bread for about 200 people in a small manner as they were starving and asking for food. We distributed these food items outside a camp immediately. Now we are supporting some of our families in Dambulla. Thirty-five families belong to our community at Dambulla and we are planning to get another 200 families outside who are really affected due to very bad floods and bad weather in the Polonnaruwa area. We are planning to support another 100 families whom we will select to provide some food items to immediately, which will include bread, rice, coconut, dhal, salmon, milk powder, tea, and sugar and some blankets, etc. Medicines will be provided as well as we realized that this has become a very urgent need. Our estimated budget for all these items will cost approximately US$15,000 for this urgently needed flood relief in Dambulla and Polonnaruwa. Right now, we have no idea how we can find this urgent relief. We do trust in God that anything is possible to help these needy families in time of trouble as it is part of our Christian walk. Therefore, we are sharing this with you, as you are our brothers and sisters in Christ so you can pray. Whatever contribution you can render to us at this time of need will be greatly appreciated. If we are able to acquire the necessary resources/funds, we are planning to conduct the relief programmes in Dambulla and Polonnaruwa on the 30th of this month. For questions about the situation in Sri Lanka, contact Ryan Iafigliola, Director of International Field Operations for The Fuller Center. 229-924-2900 or by email at ryani@fullercenter.org. 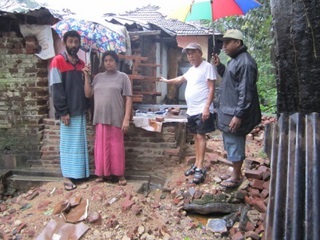 Read more about The Fuller Center’s work in Sri Lanka.